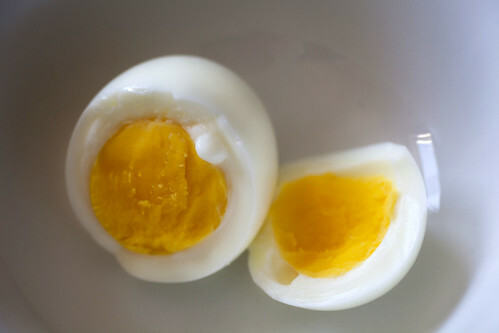 A simple boiled egg. All you need is a hard boiled egg yolk that’s sieved into the batter. Nifty, huh? As any other cookie dough you (if you do bake) worked on, the wet ingredients go in first then the flour is the final thing to dump in and stir up. As any mostly-butter-based cookie dough goes, it has to be refrigerated. Thankfully, it was a Sunday afternoon that I wasn’t rushing to bake them. Though my mom kept asking me when am I going to bake and let her eat. Hmmmph. But it’s worth the wait. 1. Place egg in small saucepan, cover with 1 inch water, and bring to boil over high heat. Remove pan from heat, cover, and let sit 10 minutes. Meanwhile, fill small bowl with ice water. Using slotted spoon, transfer egg to ice water and let stand 5 minutes. Crack egg and peel shell. Separate yolk from white; discard white. Press yolk through fine-mesh strainer into small bowl. 2. In bowl of stand mixer fitted with paddle attachment, beat butter, granulated sugar, salt, and cooked egg yolk on medium speed until light and fluffy, about 4 minutes, scraping down sides of bowl and beater with rubber spatula as needed. 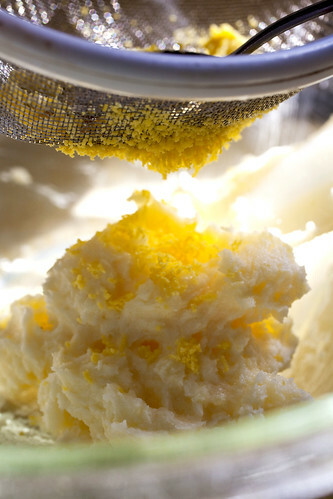 Turn mixer to low, add vanilla, lemon extract, lemon zest, and mix until incorporated. Stop mixer; add flour and toasted sweetened coconut and mix on low speed until just combined, about 30 seconds. Using rubber spatula, press dough into cohesive mass. 3. Divide dough in half; roll each piece into log about 6 inches long and 1 3/4 inches in diameter. 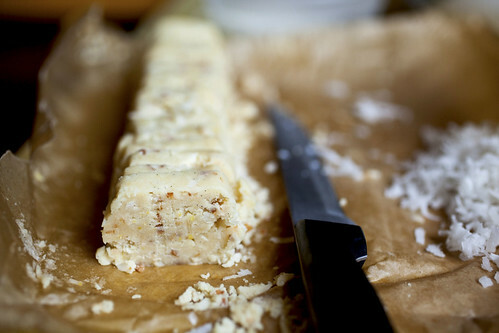 Wrap each log in 12-inch square of parchment paper and twist ends to seal and firmly compact dough into tight cylinder. Chill until firm, about 1 hour. 4. Adjust oven racks to upper-middle and lower-middle positions and heat oven to 350 degrees. Line 2 rimmed baking sheets with parchment paper. Using chef’s knife, slice dough into 1/4-inch-thick rounds, rotating dough so that it won’t become misshapen from weight of knife. Place cookies 1 inch apart on baking sheets. 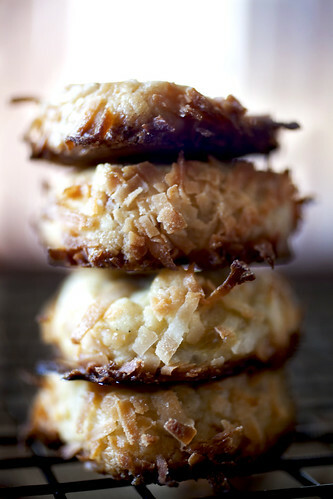 Using pastry brush, gently brush cookies with egg white mixture and sprinkle evenly with untoasted sweetened coconut. 5. Bake until centers of cookies are pale golden brown with edges slightly darker than centers, about 15 minutes, rotating baking sheets front to back and top to bottom halfway through baking. Cool cookies on baking sheet 5 minutes; using thin metal spatula, transfer cookies to wire rack and cool to room temperature. Store cooled cookies between sheets of parchment paper in airtight container for up to 1 week. My mom is doing well. To the well wishers to my mom, she is at home from the hospital. Hell, it’s been a tough two weeks for everyone in my family but at least she’s ok. The expected pain from the procedure does come in on several occasions but besides that she still has an appetite. And that’s a good thing. So glad to read that your mom is doing well. I’m keeping you and her in deepest thoughts and prayers. 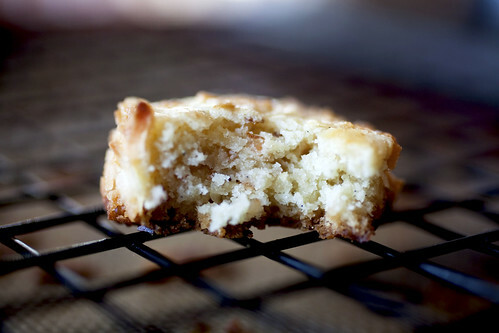 I’ve never made cookies that had hard boiled egg yolk in em…cooool. I wanna make some. The sieved hardboiled egg trick is very cool. Glad your mother is home. 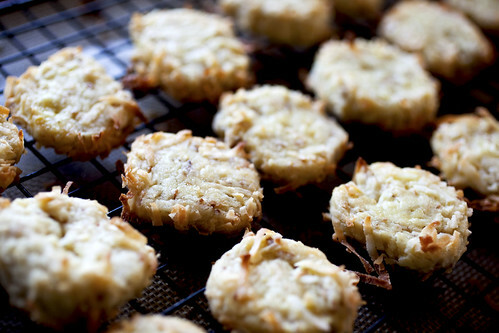 Those are gorgeous cookies!, I just started reading your blog and catching up on old posts. (I am on may 13,2007 at the moment)and I really love it. Thanks for your dedication! Looks great, TWE! I have to try ’em out. Robyn: You should make them! My mom has a really big appetite now. Sara: Indeed, it’s a neato trick. Those people at America’s Test Kitchen are crazy and great at what they do. Caterpillargirl: Yay for reading my blog! Thanks for dropping in! I think at the rate I’m posting, you’ll catch up to me.